Both salt and sugar are essential to life. They enhance flavour and act as preservatives, so there’s no way we can cut them out completely. But although many of us have cut back on a loaded salt and sugar diet (a fact confirmed by falls in UK blood-pressure and heart-disease rates), we still reach for them a little too often. Latest figures from the National Diet and Nutrition Survey (NDNS) show that when it comes to salt and sugar we’re still eating too much. They’re also ‘hidden’ in a lot of our food – an estimated 80% of our intake comes from what’s added to processed foods. So what do we need and what’s best avoided? Our blood and tissue fluids contain most of the sodium (salt) in our bodies, so it’s especially important for nerve and muscle function. If levels are too high (for example, if we’re dehydrated, have kidney disease or take drugs that cause salt retention) we become confused or comatose. But if it’s too low (for which there can be many causes, including taking water tablets), we develop muscle cramps, lethargy or fits. Our sodium levels are controlled by our brains, kidneys and adrenal glands. We mainly lose salt in sweat and urine, but a healthy balanced diet without added salt normally replaces it. Our sodium levels won’t usually become dangerous unless we’re ill, but regularly eating too much salt can cause fluid retention and raise blood pressure. Long-term, this can lead to strokes, heart attacks and kidney damage, so you’d probably need regular medication to control this. US researchers have recently said that too much dietary salt can damage our artery linings and elasticity, the kidneys and the ‘fight or flight’ part of the nervous system. Salt can also make heart failure, osteoporosis and asthma worse, while salty foods often contain other harmful chemicals. For example, processed or smoked meats and pickled foods are linked to stomach cancer. UK advice for adults and children aged 11 upwards is a maximum of 6g (about a teaspoon) of salt daily or 2.4g (110 mmol) of sodium. Younger children need less. But NDNS says most of us eat more than this (an average of 8.1g a day). A 2014 study on children found around a third of salt intake comes from cereals and bread, a fifth from meat and a tenth from dairy products. Salt makes food tastier, is habit-forming and makes us thirsty, so we drink more in pubs and restaurants. You’ll find a lot of it in crisps and other salty snacks, as well as in baked beans, ham, bacon, processed meats, soy and other sauces, ready-meals, takeaways and fast foods. Consensus Action on Salt & Health (actiononsalt.org.uk) recently said that half of all UK pizzas contain more than the 6g maximum daily amount. Even medicines, particularly soluble tablets and antacids, may contain significant amounts of sodium. 1 Just do it! It’ll take about two weeks for you to get used to it, but you will. So stick with it. 2 Don’t add salt during cooking or at the table. 3 Read labels – some state the amount of salt, some use the traffic-light system (avoid red and amber) and some show how much of your daily salt intake the food contains. 4 Enlist the kids’ help. A study in China found that teaching primary-school children about salt cut their families’ intake by a quarter. Sugar fuels our bodies. ‘Simple’ or ‘free’ sugars (glucose, fructose and sucrose) provide a quick energy boost or ‘sugar rush’, while complex sugars (wholegrain, fibrous, low-GI foods) are broken down more slowly and stored as glycogen in our livers and muscles, but can be quickly converted into glucose when needed. Children need energy to help them grow and we all need energy for exercise. Our bodies will even turn protein and fat stores into glucose if necessary (for example, when we’re dieting). Insulin, from the pancreas, plays a key role in controlling our blood-sugar level but we overload it by eating too much sugar and putting on weight (especially round our tummies). Our blood-sugar levels may creep up until we develop type 2 diabetes and serious complications such as heart disease, stroke, kidney failure or blindness. Sugary foods also trigger tooth decay and gum disease. And obesity, caused by having too much sugar, makes us more prone to heart disease, breast and other cancers and painful knee or hip arthritis. or a large glass of wine. Our total calorie (energy) needs depend on our height, weight, age and activity levels. The World Health Organization’s new guideline recommends that we should reduce ‘free’ sugars to less than 10% of our total energy intake, mainly to avoid weight gain. But the NDNS says most of us currently exceed this, usually in the form of added sugar, sweets, biscuits, cakes, pastries, chocolate and sugary drinks in our diet. Researchers say reducing sugar would increase our life expectancy, mainly by reducing heart disease and strokes. And even small changes can make a difference. According to UK recommendations, carbohydrates, including bread, cereals, rice, pasta and potatoes, should make up about a third of our diet, with another third coming from fruit and veg. The remaining third should come from other foods, including dairy, meat, fish and eggs. Choosing complex carbs, such as wholegrains, oats and fruit and veg skins, means we’ll also absorb other essential nutrients and fibre. These help body function and repair and protect against constipation. Breakfast cereals, energy drinks, tomato ketchup, baked beans and other processed foods contain sugar, which is usually added for its ‘feel-good’ factor. So-called healthy low-fat foods, such as yogurts, may also be packed with sugar. Instead, get your sweet hit from ‘intrinsic’ sugar, which is locked inside the cells of whole fruit and veg. This can be healthier because it’s released more slowly and these foods also give us essential minerals, vitamins and fibre. However, juicing liberates these sugars, while discarding the fibre and other nutrients. So limit yourself to one glass a day with food to help protect your teeth. 1 Read labels. Foods containing more than 22.5g of total sugars per 100g are high in sugar (5g of total sugars or less per 100g is low). 2 Look out for sucrose, glucose, fructose, maltose, hydrolysed starch, invert sugar, corn syrup, honey and agave syrup – they’re all sugar! 3 Slowly reduce and then stop adding sugar to sweeten hot drinks and breakfast cereals. 4 Drink water instead of sugary drinks. 5 Watch the wine and other alcohol. Dilute or alternate with fizzy water. 6 Make cakes and biscuits with wholegrains and try reducing the amount of sugar you use. 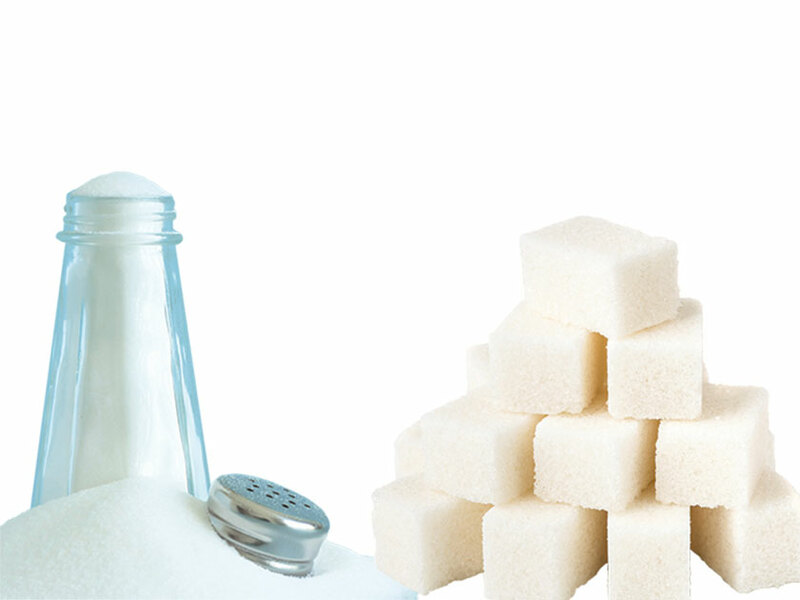 7 Avoid sugar substitutes – they’ll just help maintain your sweet tooth. Add the free FoodSwitch UK app to your smartphone. It reads the barcode of products and makes healthier suggestions.